The software supports hassle-free migration of MBOX files created in all 20 MBOX email clients – Apple Mail, Entourage, Eudora, Postbox, Netscape, PocoMail, Thunderbird, Spicebird, Opera, PowerMail, Claws Mail, Evolution, SeaMonkey, Sylpheed, Mulberry, GyazMail, Gnu, Sparrow, The Bat!, WebMail. The software is embedded with innovative programming algorithms that facilitate safe and accurate data migration. In fact, the tool converts the source MBOX files to Office 365 without causing any disturbance to the original Meta properties. With its comprehensive preview facility, the user can check the content of all migrated items before saving them at desired location. By previewing items, user can ensure the accuracy and completeness of migrated items. The MBOX to PST Conveter lets you to migrate multiple MBOX files simultaneously. The option to add single or multiple MBOX file(s) for conversion provides complete flexibility to the users at the time of migration. Move your total emails and items of Apple Mail (MBOX files) to Outlook PST files with complete accuracy. The entire migration is performed while restoring original formatting, structure, and properties of mailbox folders. 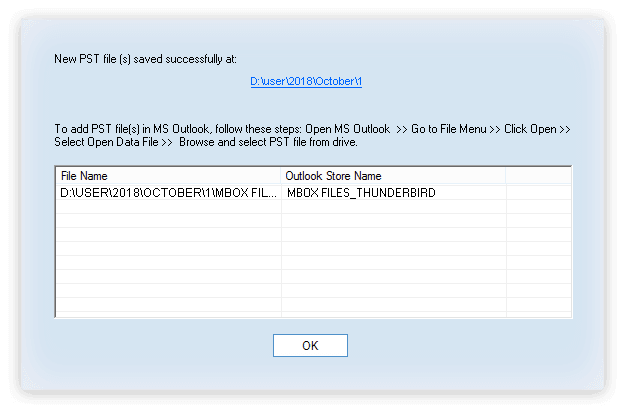 Export your valuable data from Thunderbird mailbox (MBOX files) to MS Outlook platform with utmost precision and integrity. The tool offers flawless migration of data without involving much time and efforts. 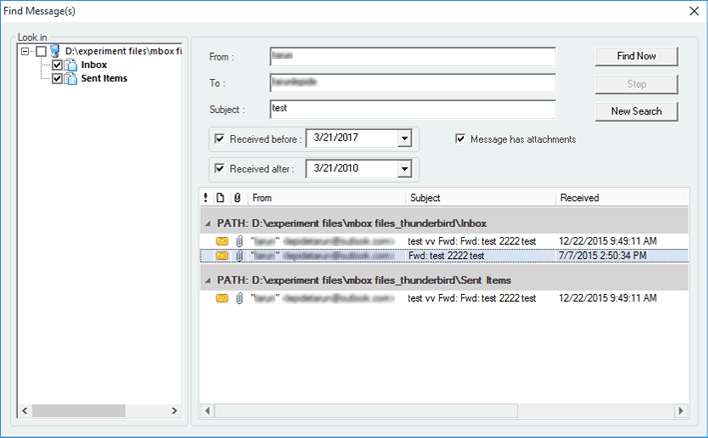 Move over your data items from Entourage mailbox to Outlook PST files, while preserving original content and hierarchy of contained folder, and subfolders. Migrate your Spicebird mailboxes (MBOX files) to PST files flawlessly. The tool migrates each and every folder of MBOX files with total precision and integrity. 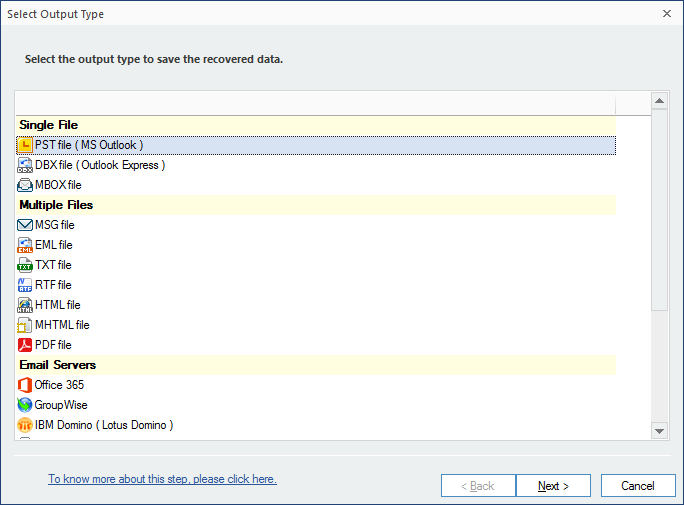 Migrated MBOX mailbox data can be saved in PST, MSG, or EML file format. Other saving destinations are email servers (Exchange/Domino/GroupWise), web mails (Gmail/Google Apps/Yahoo/AOL/iCloud/Outlook.com), and Office 365. Mailbox items can be saved in different formats too (PDF/TXT/DBX/TXT/RTF/HTML/MHTML). 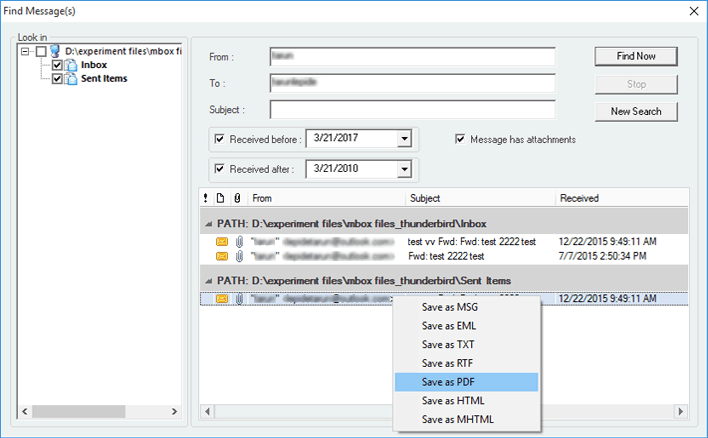 Advanced filtering options provided in MBOX to Outlook PST tool, allow users to perform selective migration of MBOX mailbox items. 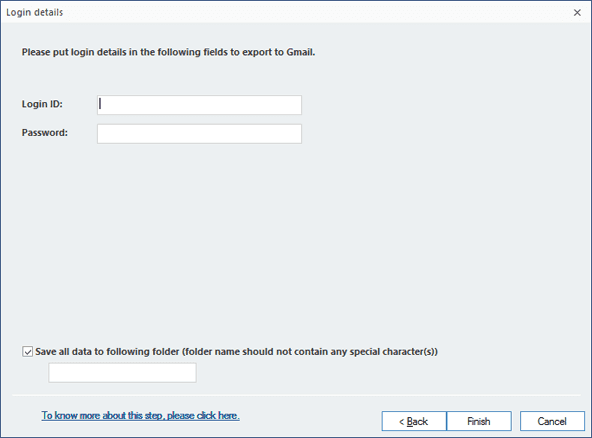 User can filter the email items using different criteria like: To, From, Subject, Date, and Attachments. The migration of MBOX mailboxes to Outlook PST file can be accomplished in three steps after the selection of the email client. The steps involved are explained as below. SelectIn this step, make use of the Add File(s) button to add the MBOX files or Add Folder button to add the folder containing the MBOX files. PreviewIn this step, one can preview the mailbox data. SaveIn this step, use the saving options provided by Kernel for MBOX to PST to save the data. How do I convert MBOX files to PST with the help software? Launch Kernel for MBOX to PST software. Select MBOX file(s) or add folder containing MBOX files. Check Preview of all mailbox folders. Choose the Output file format from the list of formats. 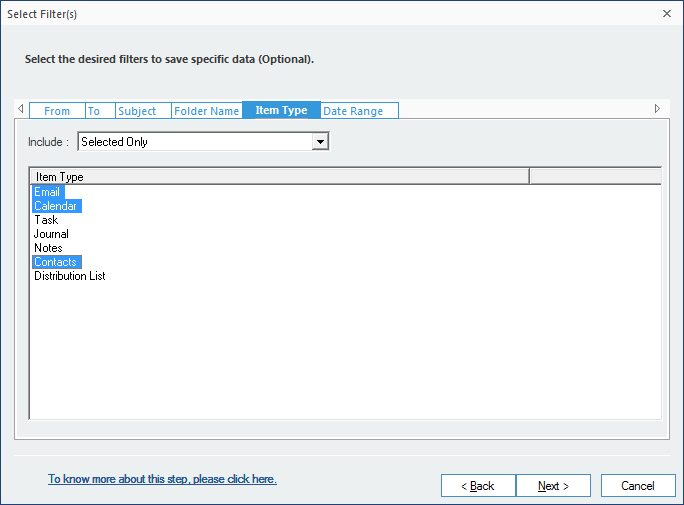 For selective migration, use data filters by criteria. 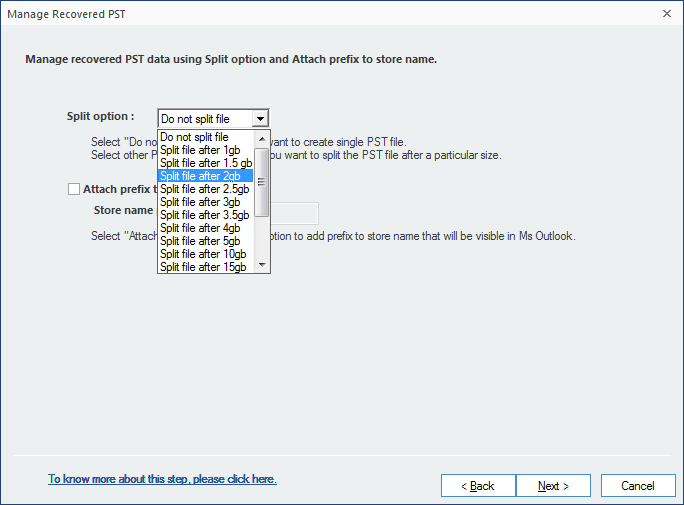 Set path to save PST file. 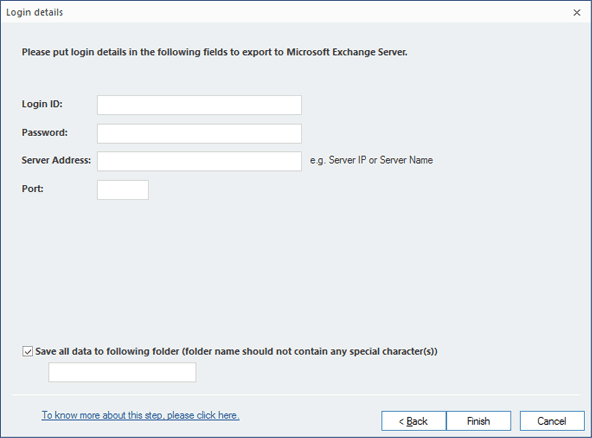 Does the tool allow batch migration of MBOX files? Yes, it does. The solution allows the migration of multiple files at once from any MBOX-supported email client to PST file, Office 365 and others. Can I convert selected emails and items from MBOX to PST file? Yes, you can. 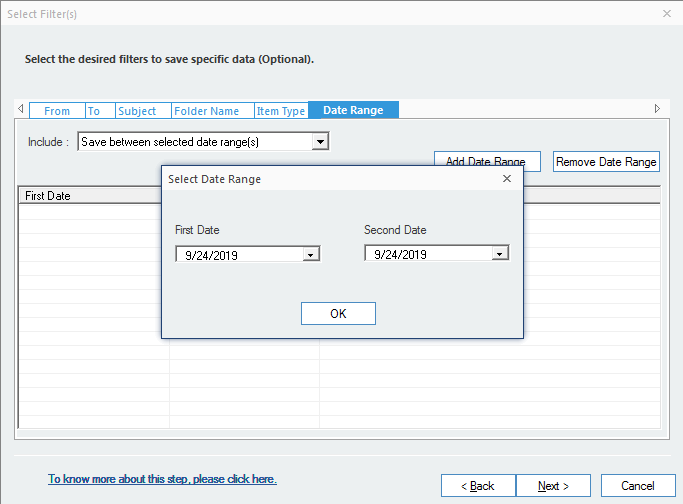 The tool has smart filter facility to segregated selected items based on date range, subject, folder name, item type etc. Does the demo version allow to save MBOX emails to PST? The demo version allows to save only 25 items per folder from MBOX file to PST file. Can I run the tool on Windows 10 PC? Yes, you can. 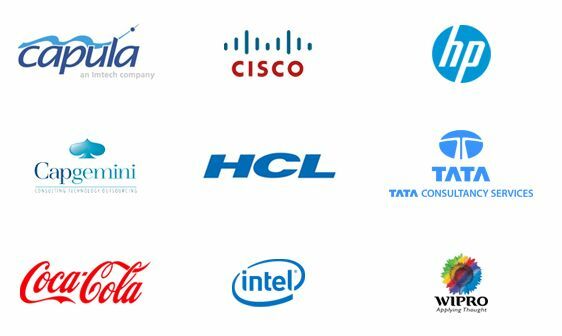 The tool is compatible with all versions of Windows operating systems including – Windows 10, 8.1, 8, 7, Vista, XP, 2000, 98, NT and 95 and Windows Server 2012, 2008 R2, 2008, 2003 R2, 2003. Is there any limitation of file size for conversion? No, there isn’t. The tool allows smooth migration of large-sized MBOX files without any file size limitation. Does the home license allow to export email files from thunderbird into office 365? No, it does not. 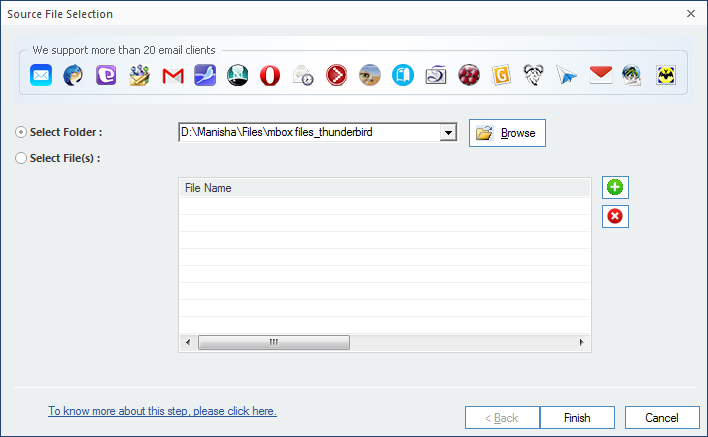 The home license allows to migrate Thunderbird mailbox (MBOX file) to PST file only. To export MBOX file to Office 365 user account, you’ve to upgrade to Corporate License. Does it support Gmail to PST migration? Yes, you can. 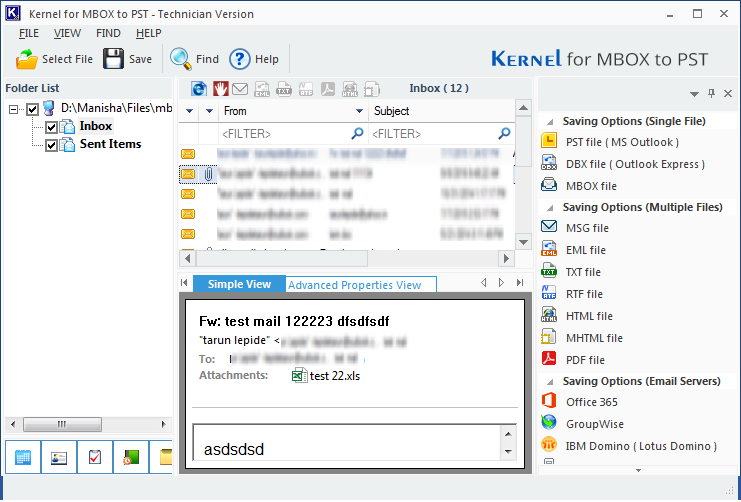 Kernel for MBOX to PST converter supports 20 different email clients including Gmail web email client for the data migrations. Can the software migrate Mac emails with its properties to PST file? Yes, it can. 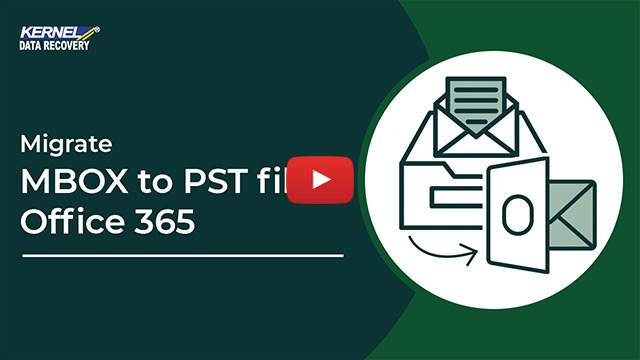 Kernel for MBOX to PST converter makes sure that your emails are migrated with its original properties and structure to the destination platform – PST file or Office 365 mailbox. The tool does not alter the mailbox properties after the conversion. The technician version is wonderful, I could perform data recovery easily. Great tool, awesome support, and easy to use graphical user interface. Kernel Data Recovery happily announces the release of latest version 18.1 of its powerful tool Kernel for MBOX to PST Converter. With the most recent improvements and bug fixes, the tool converts MBOX files to PST files more efficiently and accurately. Also, it offers smooth conversion of all the latest versions of 20 MBOX email clients. Lepide Software announces the release of Kernel for MBOX to PST version 17.1 with many new features. This tool now allows users to save MBOX mailboxes in email servers like Exchange Server, Novell GroupWise, and Domino. Also, users can export MBOX emails to web mails like Gmail, Yahoo, AOL, Outlook.com, iCloud, and Google Apps. A facility to save emails in DBX, MSG, TXT, HTML, PDF, MHTML formats has also been added. The new version, with its improved performance and support for all the versions of 20 MBOX email clients, makes MBOX to PST migration quite simple and effortless. Kernel for MBOX to PST software is rolled-out with some decent upgrades in its latest release of version 16.0. The upgraded version aims to provide enhanced user experience through its improved Graphics and technical advancements. Lepide Software happily announces the release of the latest Kernel for MBOX to PST 15.8 software version. The new and upgraded version 15.8 is now incorporated with an Office 365 migration feature. With this upgrade, apart from saving MBOX files in PST or MSG formats, you can also migrate MBOX files to cloud-based Office 365 accounts. Furthermore, the latest version 15.8 is made fully-compatible with the latest Windows 10 and MS Outlook 2016 version. Lepide Software Pvt Ltd has successfully launched the updated version 14.07.01 of Kernel for MBOX to PST Software. The updated version now ensures better migration for MS Outlook 2013 and supports Windows 8.1 operating system. Lepide Software Pvt. Ltd. announces the release of an updated version 14.01.01 of Kernel for MBOX to PST software. The new released version now supports 9 more email clients - Evolution, SeaMonkey, Claws Mail, Sylpheed, Mulberry, GyazMail, Gnu, Sparrow and The Bat! for converting MBOX files to MS Outlook PST or MSG files. The software now displays preview of all the added MBOX files before saving them to either PST or MSG file format. Moreover, it enables saving MBOX file data according to folder hierarchy. The new version can now also be installed on systems running Windows Server 2012 OS. Lepide Software Pvt. Ltd. announces the release of Kernel for MBOX to PST - an expedient tool to convert all email items of MBOX files created with Apple Mail, Entourage, PowerMail, Thunderbird Postbox, Netscape, PocoMail, Eudora, Spicebird and Opera Email clients to PST files that can be easily accessed with MS Outlook. The utility allows adding single as well as multiple MBOX file(s) and facilitates saving converted files either into a newly-created PST file or already-existing PST file. 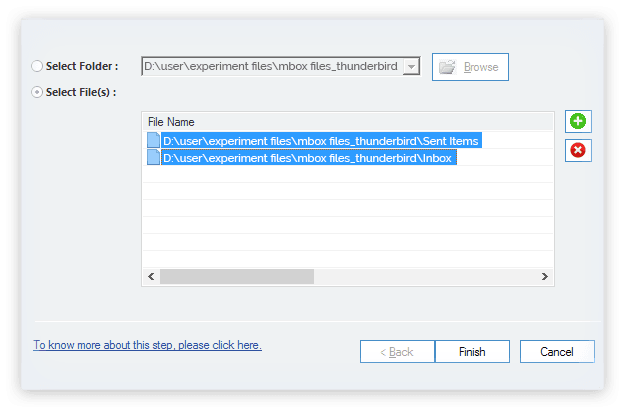 Backup and export single/multiple Thunderbird mailboxes to PST/Office 365. 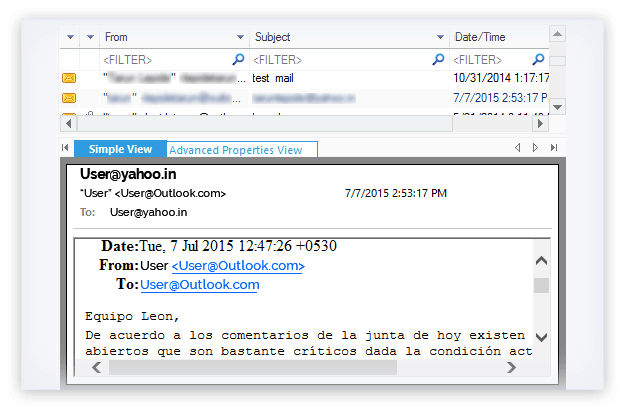 Recover and save corrupt EML/EMLX emails to PST, MSG, or Office 365.